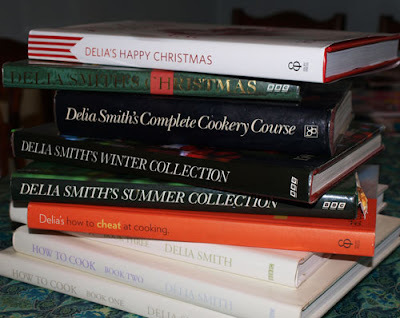 I know I shouldn't but I just can't resist a cook book, especially one by Delia Smith. Having had a quick flick through, there are a few recipes from other books but also some new ones. I'll let you know how I get on with it. I thought I should share my 'Delia' collection lol! I also used to have 'One is fun' but gave it to my SIL who was more in need of a solo cook book. The only one I've hardly used is 'How to Cheat' as I am already very experiened at cheating lol! I hardly ever use the How To Cheat one either,but I do use the others from time to time. Like I said, I only had the newest Christmas one in my house for several hours when I was putting together the Christmas Cake. I have been making her fruitcakes for years now. They are excellent, as are all of her recipes that I have ever tried. You can't beat a Delia recipe!!! I haven't made one single thing out of Delia's How to Cheat!!! You seem to have the same collection of books as I do. Her new Christmas Book is great - but I have noticed that she has revisited many of her old recipes and it would have been good if they were all new ones - we need value for money. 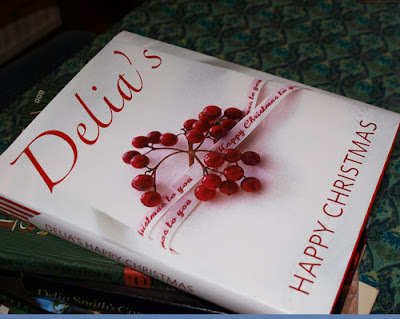 I so love Delias books!! The recipes always work!! She also gives good tips & tricks!! She totally ROCKS my world! As a vegetarian, I have her Vegetarian Collection. I really like it. As a seasonal cook, I also have her Summer and Winter Collection. Its true what Marie says 'you can't beat a Delia recipe'. I really love her carrot cake recipe. Rice is nice, but cheesecake is better! Woo hoo look at my new blog banner! Guest Blogger on Chow and Chatter!